Technical analyst Clive Maund charts a neuromonitoring company that he believes is undervalued. 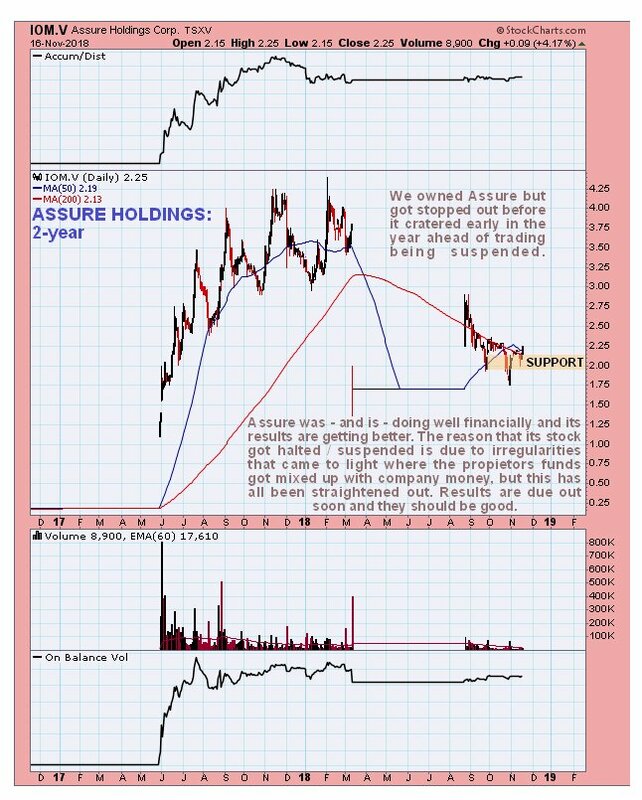 Assure Holdings Corp. (IOM:TSX.V; ARHH:OTCQB) is a stock that we were involved with about a year ago, but we got stopped out ahead of it suddenly plunging, as can be seen on its 2-year chart below. It plunged dead ahead of being suspended from trading due to irregularities which, as I understand it, involved the proprietor’s money being mixed up with the company’s money. The problems got straightened out and the stock resumed trading in August. All the while, however, the company has continued to be very successful and to make more and more money, which means that the stock is now undervalued. On the latest 6-month chart we can see in detail all the action in the stock since it resumed trading. After an initial surge it dropped back at a decelerating rate, probably due to liquidation by investors who soured on the stock after being caught by the plunge, and has stabilized roughly in the vicinity of the support level shown. It looks like it is turning up and preparing to break out upside from the curved channel shown, a contention which is supported by the positive volume pattern and volume indicators, and should have a window of opportunity to do this before the stock market crashes, and here we should remember that even during general bear markets some stocks go up, if the companies are making money. Results are due out soon, and may well be the trigger for an upside breakout. 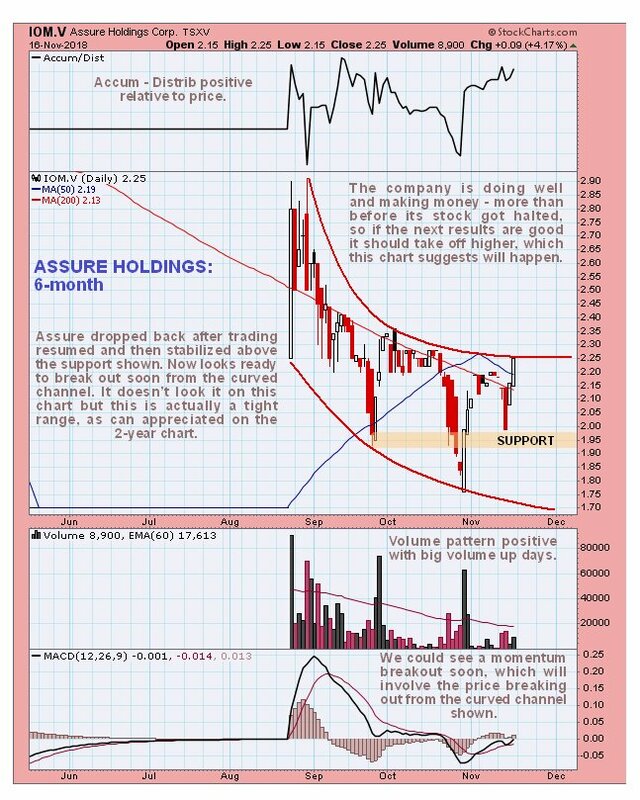 The conclusion is that Assure Holdings is rated a buy here and especially on any near-term minor dip back towards support in the C$1.95 area for an upside breakout from the curved channel shown on our chart, which should lead to significant gains. Point for a stop is C$1.89. There are 35.5 million shares in issue. Assure Holdings Corp, IOM.V, ARHH on OTC, closed at C$2.25, $1.64 on 16th November 2018. 1) Clive Maund: I, or members of my immediate household or family, own shares of the following companies mentioned in this article: None. I personally am, or members of my immediate household or family are, paid by the following companies mentioned in this article: None. My company has a financial relationship with the following companies mentioned in this article: None. CliveMaund.com disclosures below. I determined which companies would be included in this article based on my research and understanding of the sector. 2) The following companies mentioned in this article are billboard sponsors of Streetwise Reports: None. Click here for important disclosures about sponsor fees. 3) Statements and opinions expressed are the opinions of the author and not of Streetwise Reports or its officers. The author is wholly responsible for the validity of the statements. The author was not paid by Streetwise Reports for this article. Streetwise Reports was not paid by the author to publish or syndicate this article. The information provided above is for informational purposes only and is not a recommendation to buy or sell any security. Streetwise Reports requires contributing authors to disclose any shareholdings in, or economic relationships with, companies that they write about. Streetwise Reports relies upon the authors to accurately provide this information and Streetwise Reports has no means of verifying its accuracy. 5) From time to time, Streetwise Reports LLC and its directors, officers, employees or members of their families, as well as persons interviewed for articles and interviews on the site, may have a long or short position in securities mentioned. Directors, officers, employees or members of their immediate families are prohibited from making purchases and/or sales of those securities in the open market or otherwise from the time of the interview or the decision to write an article until three business days after the publication of the interview or article. The foregoing prohibition does not apply to articles that in substance only restate previously published company releases. As of the date of this article, officers and/or employees of Streetwise Reports LLC (including members of their household) own securities of Assure Holdings, a company mentioned in this article. Charts provided by the author. The above represents the opinion and analysis of Mr Maund, based on data available to him, at the time of writing. Mr. Maund’s opinions are his own, and are not a recommendation or an offer to buy or sell securities. Mr. Maund is an independent analyst who receives no compensation of any kind from any groups, individuals or corporations mentioned in his reports. As trading and investing in any financial markets may involve serious risk of loss, Mr. Maund recommends that you consult with a qualified investment advisor, one licensed by appropriate regulatory agencies in your legal jurisdiction and do your own due diligence and research when making any kind of a transaction with financial ramifications. Although a qualified and experienced stock market analyst, Clive Maund is not a Registered Securities Advisor. Therefore Mr. Maund’s opinions on the market and stocks can only be construed as a solicitation to buy and sell securities when they are subject to the prior approval and endorsement of a Registered Securities Advisor operating in accordance with the appropriate regulations in your area of jurisdiction. Sign up and you can get the latest news from the world of trading! * 100% No Spam Guarantee!